It's extra hard to "be present" when we are "getting ready". You're trying to get out the door; but, suddently anxiety kicks in - and a thousand little details get in the way of getting out. You run around trying to do this and that - while the clock is ticking and the heart beats faster. Getting ready wears you down. What to do? We could make "getting ready" a practice like meditation practice. Real meditation is to be here ever more deeply; but, it helps to use a feedback system which is meditation practice. It's like dancing. Practicing dancing is not dancing; or, to take another example, practicing thinking is not thinking. Thinking is free and wild; so is dancing when it's dancing. The reason we practice dancing or thinking (using logic, for example) is to perfect certain point techniques or competencies. We can apply "practice" to getting ready to go out the door. Be aware of "getting ready" and pay attention. Stay present, letting go of the forward rushing feeling that all too often grips us; notice that feeling, stop, breathe, and let go; then proceed again with going out the door. Someday, we just go out the door. There will be no sense of getting ready; just movements. No practice at all! Free and easy it will be. 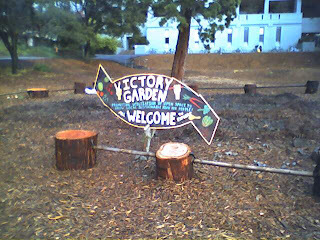 Walking by a vacant lot (in front of Evans Hall) on a late rainy afternoon at the UC Berkeley campus; surprised and pleased to find a student initiated victory garden - to grow food for the campus community. 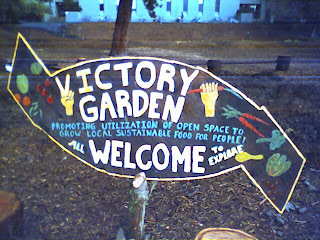 Yes, we can change the world one plot of earth at time.